At the conclusion of an ongoing operation by the Macon County Sheriff’s Narcotics Unit search warrants were executed resulting in one suspect being arrested and two others currently listed as “WANTED”. On January 23rd, MCSO Detectives and the MCSO Special Response Team executes a search warrant on the residence located at 2755 W Old Murphy Rd. where drugs have been purchased during an ongoing narcotic operation called Operation Ice Storm. Following the execution of the search warrant, Detectives were able to seize approximately 70 Grams of Methamphetamine and seized several firearms. 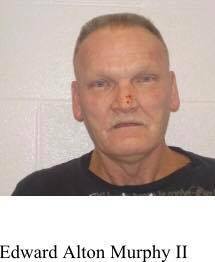 Following his arrest Murphy was placed under a $200,000 bond by Magistrate Brogden. Order for Arrests have been issued for Gerald Wayne Shope and Natasha Bates Dehart following True Bill of Indictments by the Macon County Grand Jury. Gerald Shope and Natasha Dehart were last known to be travelling in a black in color Volkswagon Jetta.